you can also see it in help -> about -> check for updates -> "firefox is up to date"
I assume this is a result of bug 724231, where we switched to using a cairo transform to create "synthetic" italics (slanting the regular font) when no real italic face is available. Unfortunately, the presence of a transform (other than simple scaling) disrupts the hinting that would normally be applied. The switch to using the cairo transform was needed to avoid cases where asking GDI to synthesize "italics" may result in it actually using an incompatible real-italic face. However, I think we can detect whether there is actually any risk of that, and return to using GDI styling in most cases - particularly, for common examples such as this one. Not yet tested, but I think this is an approach that should help. This bug occurs with Arial font italic Arabic, with the font size 12. 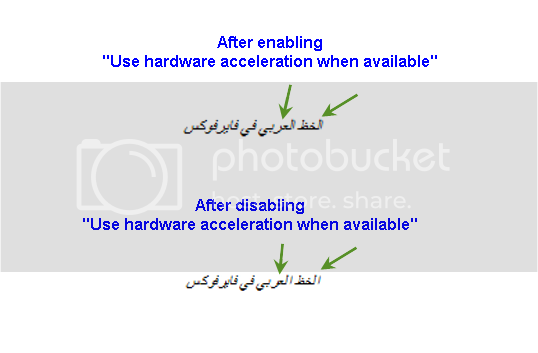 Italic font in search rectangle, appears not bold when you disable hardware acceleration in Firefox version Arabic. Checked that this improves the appearance of synthetic-italic examples such as Tahoma under GDI on Win7; should help similarly on XP. Tryserver build available at https://tbpl.mozilla.org/?tree=Try&rev=f6c9dd97781f. > acceleration in Firefox version Arabic. I don't think that's related to this issue; please file a separate report about it. > This bug occurs with Arial font italic Arabic, with the font size 12. The patch here will not fix the issue for Arabic text using Arial (or Times) with italic style, because those are precisely the cases that are affected by bug 724231 and forced us to switch to using a transform to slant the text. To solve the poor spacing that can occur there, we'd need to figure out how to maintain proper hinting and grid-fitting of the glyphs, despite the presence of the transform, which is a trickier issue. Fortunately, once this patch is applied, the issue will only affect a few relatively rare situations. looks good. this patch also fixes bug 728537. > > acceleration in Firefox version Arabic. > looks good. this patch also fixes bug 728537. More precisely, it will fix it for the same set of cases as it fixes the spacing issue (i.e. it'll resolve the great majority of use cases, but there will be a few exceptions such as "italic" Arabic text in Times New Roman or Arial fonts, and probably a few others). > transform to slant the text. I suspect the bug 724231 is a regression from bug 603879. No, it's not related to bug 603879. The main cause of bug 724231 was the fix in bug 668813, because it causes us to use synthetic styling instead of falling back to a different font family in certain cases. This is what made ​​me think that bug 724231 is a regression from bug 603879. 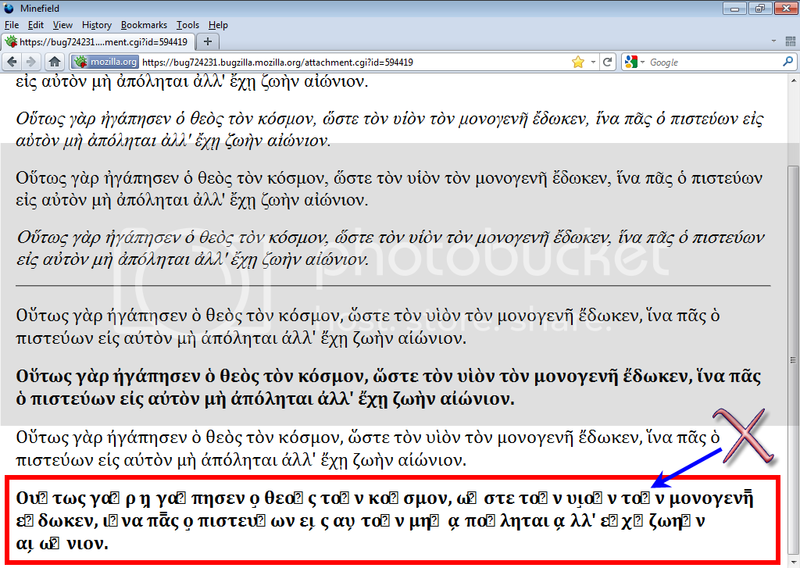 The failure in the Greek example appears on that date because we enabled harfbuzz shaping for Greek script, but in principle it could have failed in other cases even prior to that. They were just rarer; whereas bug 668813 made them show up in a much more common case (italicized Arabic). But the fundamental problem already existed. Did you mean Cairo software library http://www.cairographics.org? If Yes, Updating to the latest version may solve the bug. > as Tahoma under GDI on Win7; should help similarly on XP. I don't see how that's related to this bug report. The screenshot looks like an example of bug 598900. Run FF13 or Nightly on XP or Win7 with 'gfx.direct2d.disabled' set to true. Expected result: first two text boxes should appear with more even spacing, as in Chrome/IE9. especially since it's in content as well, what's holding this up? problems as much as possible. correctly. These are both regressions caused by the original 724231 patch. We should only be using the cairo oblique path when (1) it's a local user font and (2) the family has italic faces. This patch appears still applies cairo oblique in the local(Tahoma) case which it really shouldn't. > font and (2) the family has italic faces. Or in the original problem case: when it's an installed platform font that has an italic face, but font-matching has chosen a non-italic face because of character coverage. > cairo oblique in the local(Tahoma) case which it really shouldn't. For a local user font, we don't have details of other members of the (platform, not CSS) family readily available, so we'd have to do additional work to determine whether there's an italic face that GDI might automagically use. I suppose we could make gfxGDIFontList::LookupLocalFont record a reference to the platform family where the font was found in the new "local" fontEntry it creates, so that we'd be able to check on the other platform family members. Here's a version which handles the local-tahoma case, as suggested above, by keeping track of the "platform family" associated with a src:local() face. This should be a separate bug, IMO, and needn't block fixing the spacing issue here. It's a regression from bug 724231. I think we should get this write and stop futzing about with a sequence of tweaks that cause regressions in other places. Normally I would agree but in this case I think focusing on a solution that covers the edge cases is important. Argh, spelling regression there, s/write/right/. bold decision is made in roughly the same area of code. simple bool flag is stored rather than a pointer. Here's a version along the lines suggested in comment #33. Can we back port the patch and Bug 724231 patch to beta and aurora? Bug 724231 should already be there - it landed for mozilla-13, I believe. Or did you mean bug 764805 (the other issue mentioned here as a regression from 724231)? I don't think that is serious enough to justify backporting - it's a minor issue in an obscure and unusual use-case that other browsers don't handle consistently either. I think we could consider backporting this fix, but let's give it a few days on Nightly first to see if any problems show up. > Bug 724231 should already be there - it landed for mozilla-13, I believe. > don't handle consistently either. > on Nightly first to see if any problems show up. Yea. I mean bug 764805 patch. Waiting for the next release fix. I agree, this fix needs to go to beta/aurora to fix the regression caused by bug 724231 but the fix for bug 764805 doesn't need to be rushed. Patch transplanted to the m-b tree. Only one trivial fixup was needed to make it apply correctly; carrying over r=jdaggett. User impact if declined: poor rendering (erratic glyph spacing) in italic text with some very common fonts on Windows/GDI systems. Testing completed (on m-c, etc. ): several weeks on m-c with no observed problems; users confirm the issue is fixed there. Risk to taking this patch (and alternatives if risky): minimal risk, essentially reverts to pre-724231 behavior for most fonts, making that fix more narrowly targeted to the cases where a real problem existed. The alternative of backing out 724231 is known to cause more serious breakage (completely garbled text, though in less-common cases). This went to Aurora in the recent uplift, so the fix will go out in FF16, but given the low risk and the visible nature of the regression, I think we should consider uplifting it to FF15. Attachment #644640 - Flags: approval-mozilla-beta? Thanks for the risk eval, looks like taking this on 15 isn't too risky - if you can land today and get this into the Beta that goes to build tomorrow, great. > Run FF13 or Nightly on XP or Win7 with 'gfx.direct2d.disabled' set to true. Saw the issue on FF 13.0.1.